A male in his 50s with no known medical history presented for chest pain and shortness of breath of approximately 1 hour duration. Despite the unacceptable quality of the ECG, there are still some concerning features that can be seen while waiting for a repeat with higher quality. The human eye can correct somewhat for the moving baseline and recognize STD in V1-V3 and minimal STE in I and aVL. In the first complex in leads V1-V3, in spite of a rising baseline, the ST segment is below the PQ junction. In our opinion this is suspicious for high lateral and posterior OMI, but would not be diagnostic without an adequate ECG. They tried several times to get a better baseline but were unable. Regular, wide complex tachycardia. There is a monophasic R-wave in aVR and there is a very slow onset to the QRS (see especially lead V3). So this is Ventricular tachycardia. This Ventricular tachycardia has an RBBB/LAFB-type morphology (Tall R-wave in V1, S-wave in lateral leads, Left axis, suggesting that its origin is in the posterior part of the LV). How about ST segments? Can you interpret them in the context of VT?? There is excessively discordant STE in V5-V6 and I, with excessively discordant STD in V1-V4. Even in the setting of VT, one can see the signs of posterolateral OMI. Classic posterolateral OMI, so obvious that it probably even meets the STEMI criteria (depending on your measurement in V5-V6, and whether you use anterior lead criteria for posterior STEMI which is controversial and differing among guidelines). New we can also see inferior STE and large T-waves, indicating that the occluded artery also supplies the inferior wall. However, it appears that the posterolateral distribution is it's primary territory, as the changes seen in all ECGs were overall more pronounced in the posterolateral leads. This ECG initially shows ventricular bigeminy which then converts to ventricular fibrillation after R-on-T phenomenon. 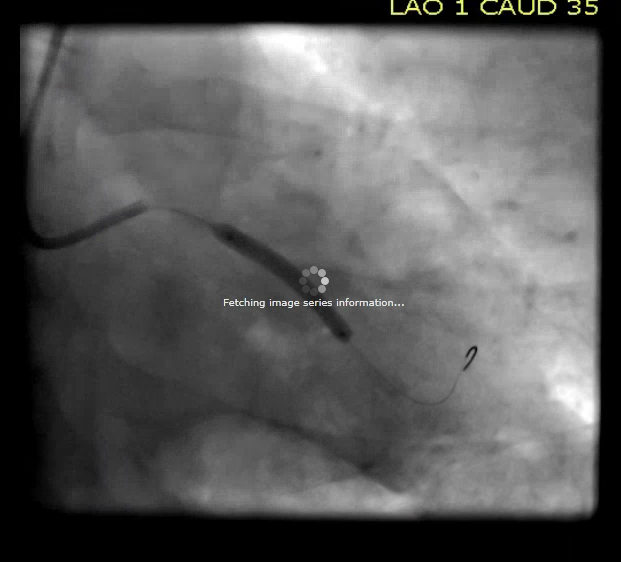 Diseased but non-acute RCA without occlusion. Occlusion of the proximal LCX. 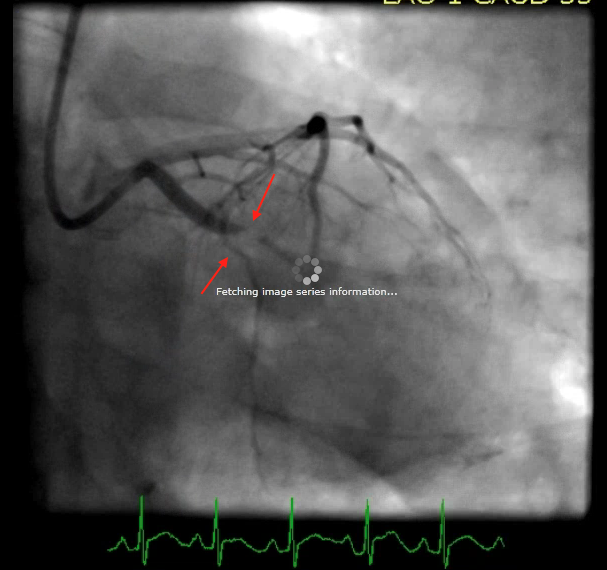 Arrows point out the LCX occlusion. 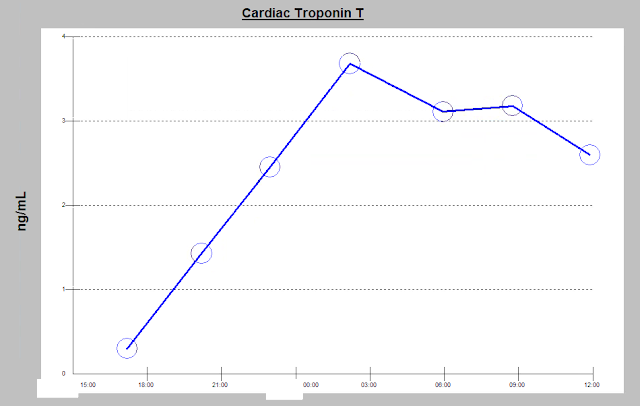 Troponin T peaked at 3.68 ng/mL within 12 hours of presentation. OMI can be detected earlier by expert interpretation than by STEMI criteria. In some cases, OMI can only be detected by expert interpretation. In other cases like this one, subtle evidence of OMI may be all you get prior to a lethal arrhythmia. 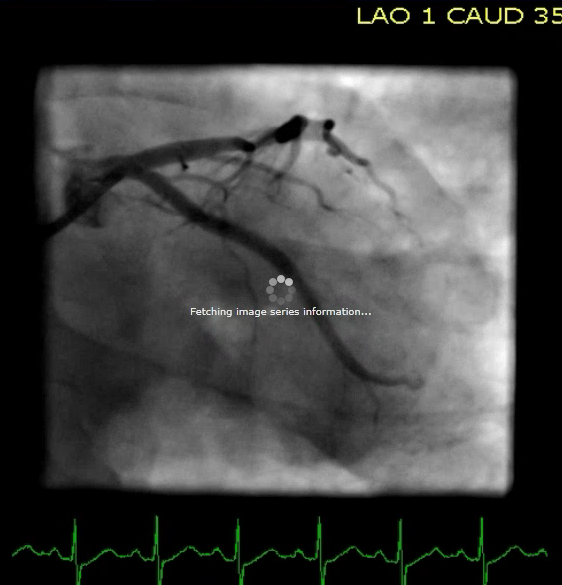 OMI can be recognized in the setting of abnormal QRSs such as LBBB, paced rhythm, and even PVCs and VT in some cases. OMI causes increased repolarization dispersion and ventricular irritability leading to PVCs that land on a T-wave with increased dispersion, resulting in R-on-T phenomenon and VF arrest. ii) How acute OMI can also be presumed from the 2nd ECG when the patient developed VT. Both of these findings could be ever-so-easy to overlook! I’ll limit my comments to the 2nd and 3rd ECGs done in this case — which I’ve put together for clarity in Figure-1. Figure-1: Comparison of the 2nd ECG in this case (TOP), when the patient developed VT — with the 3rd ECG (BOTTOM), after synchronized cardioversion restored sinus rhythm (See text). 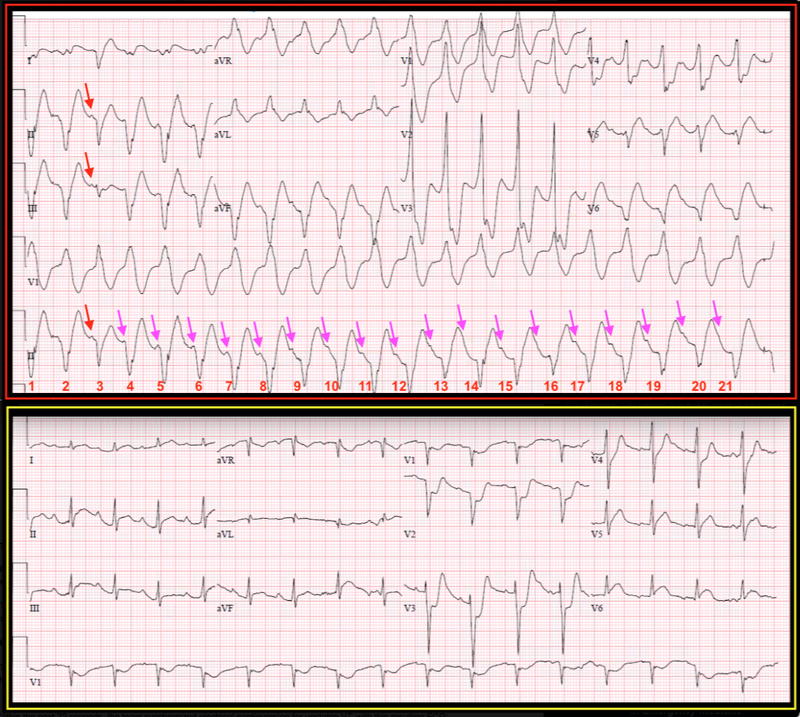 As per Dr. Meyers — the 2nd ECG in this case shows VT (TOP in Figure-1). In addition to the generally slow onset of the QRS and monophasic R wave in lead aVR — there are other reasons that confirm with virtual 100% certainty that this rhythm is VT. 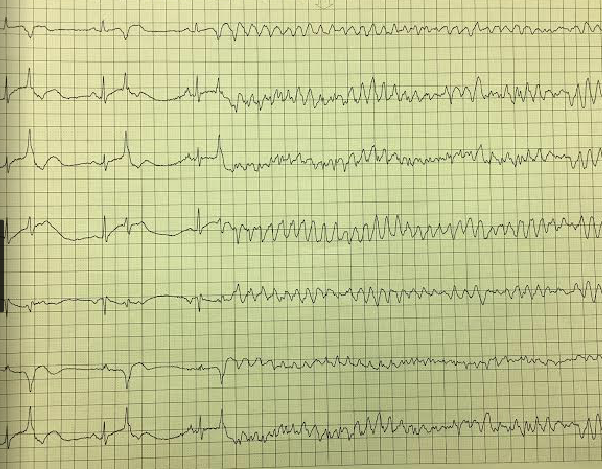 These include: i) Extreme axis deviation in the frontal plane (ie, all negative QRS in each of the inferior leads); ii) All negative QRS in lead V6; iii) A capture beat; and iv) AV dissociation. Each of these 4 additional features by itself convey >95-98% likelihood that a regular WCT ( = Wide-ComplexTachycardia) will be VT. While the diagnosis of VT in this case was easily made without any of these additional features — my point is that expanding our diagnostic armamentarium by awareness of additional easy-to-remember-and-apply criteria may at times prove invaluable when other clues to the diagnosis of VT are absent. For detailed discussion on how I apply this approach for assessing regular WCT rhythms — CLICK HERE. Recognition of the capture beat and AV dissociation in this case is worthy of additional comment. Note that beat #3 is clearly different from other beats in this tracing! I believe beat #3 is preceded by a P wave (RED arrow) that is at least partially conducting. I’ll emphasize that it is unusual to see definite evidence of AV dissociation in faster forms of VT, because underlying atrial activity is almost always hidden by the QRS and ST-T waves. The reason why I believe AV dissociation is present here — is that I am able (with calipers) to march out regular atrial activity with a varying PR interval throughout the long lead II rhythm strip (PINK arrows). 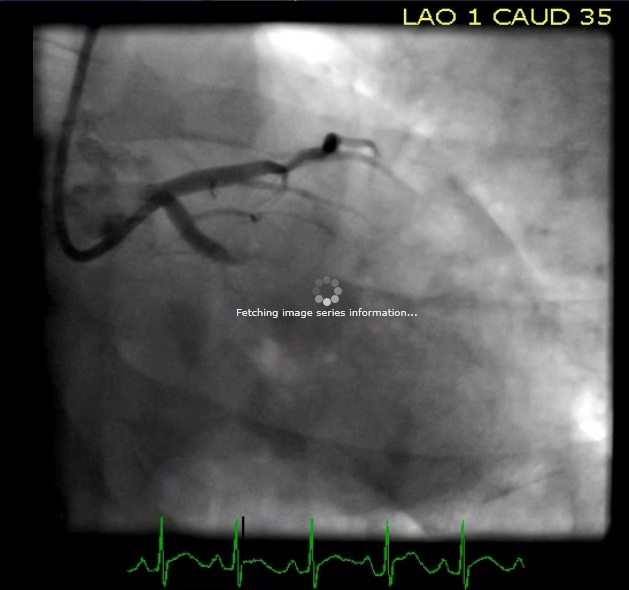 While difficult to determine if beat #3 reflects fusion or capture (or more likely some combination of the two) — the point is that in association with regular underlying atrial activity — this finding confirms VT.
Dr. Meyers made the very astute observation that even during VT — there is evidence of acute posterolateral OMI. To optimally illustrate this important point — I’ve put the VT tracing and the post-cardioversion tracing together (Figure-1). Doing so facilitates recognition of the ST elevation beyond-that-expected-for-VT that was present in the TOP tracing in leads I, V5 and V6. We can also easily appreciate the dramatic ST depression in the TOP tracing in leads V3 and V4 that is clearly beyond-that-expected-for-VT. On occasion, this phenomenon that allows recognition of acute OMI from a 12-lead ECG showing sustained VT may prove invaluable in expediting diagnosis and optimal management. Our thanks to Drs. 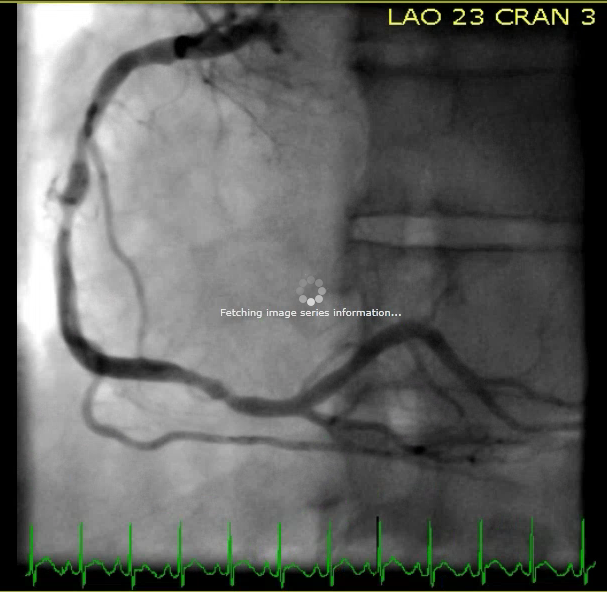 Meyers and Iyer for this superb teaching case! How to differentiate between De winter T waves from Posterior MI STd? de Winter's have less STD and larger T-waves.